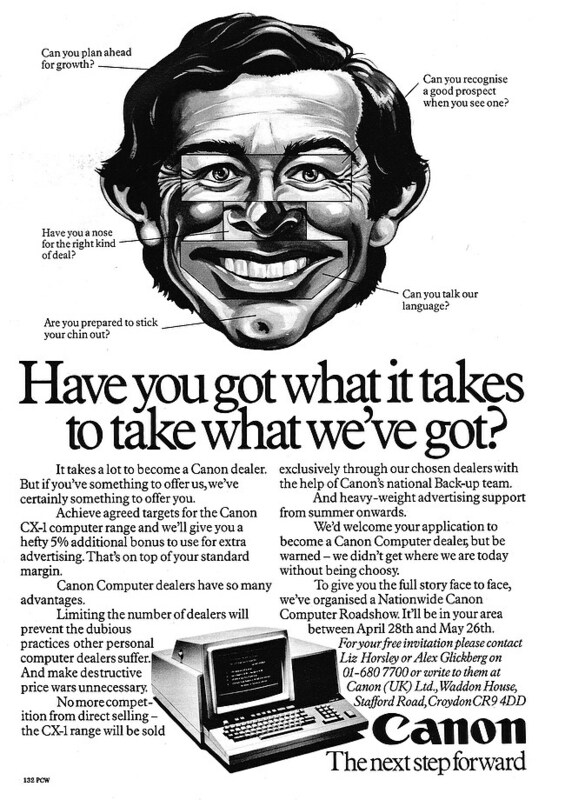 nosher.net - Canon advert: Have you got what it takes to take what we've got? Have you got what it takes to take what we've got? This advert from Canon was aimed at potential resellers rather than buyers and was for the Canon CX-1, a machine first announced in 1981. Following the announcement, Canon went rather quiet about the machine as the software for it wasn't actually working, but the problems were finally sorted out and the machine debuted at the Info 82 exhibition in the City of London. The CX-1 used Motorola's 6809, the same CPU as used by the Dragon, Tandy Color Computer and the high-end Fortronic F500 - a chip, like Intel's 8088 as used in the IBM PC, that was not-quite-but-almost 16-bit. The 6809 never caught on as a business-machine CPU, as converting applications from the hugely-popuplar 8080 or even Z80 world was a difficult job, whilst Intel provided an easier upgrade path for software developed for its chips via the XLT-86, which converted 8080 source code to 8088 or even the new 16-bit 8086. If Canon had managed to get its machine out a year earlier, things may have been different, as back then the 6809 would be have had an impressive spec. As Guy Kewney of Personal Computer World said, "if the Canon had been on the market, actually selling in tens and hundreds, for the last year, there would now be several thousand, all attracting their programmer owners to write code, [but] now it is neither ultra-modern, nor particularly powerful, nor particularly cheap. A year ago it was all of these". Canon later signed up as part of the MSX consortium, the Microsoft-sponsored attempt to produce a single specification that multiple manufacturers could build to whilst still maintain peripheral and software compatibilitity. The coming of MSX (and the Japanese) was feared for several years, although by the time MSX finally arrived its spec was a couple of years behind and it was never a threat. The "heavy-weight advertising support" that Canon offered also never seemed to materialise.